The new ground-based telescope ALMA has taken an amazing image of a baby star and the planet-forming accretion disk that surrounds it. 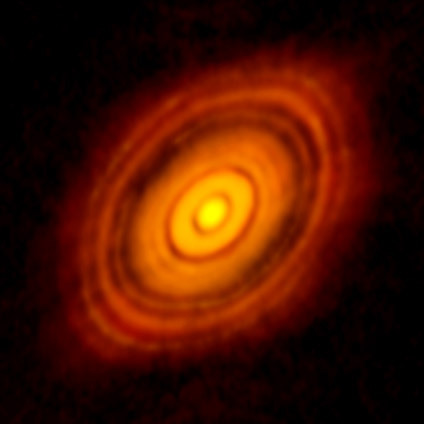 ALMA uncovered never-before-seen features in this system, including multiple concentric rings separated by clearly defined gaps. These structures suggest that planet formation is already well underway around this remarkably young star. “These features are almost certainly the result of young planet-like bodies that are being formed in the disk. This is surprising since HL Tau is no more than a million years old and such young stars are not expected to have large planetary bodies capable of producing the structures we see in this image,” said ALMA Deputy Director Stuartt Corder. ALMA has just been completed and is only in its initial shake-out period. It is also not an optical telescope, but observes in longer wavelengths above infrared. Thus, it can peer through dust clouds to see details like this. And these details confirm that the most accepted theory of planetary formation appears to be right.